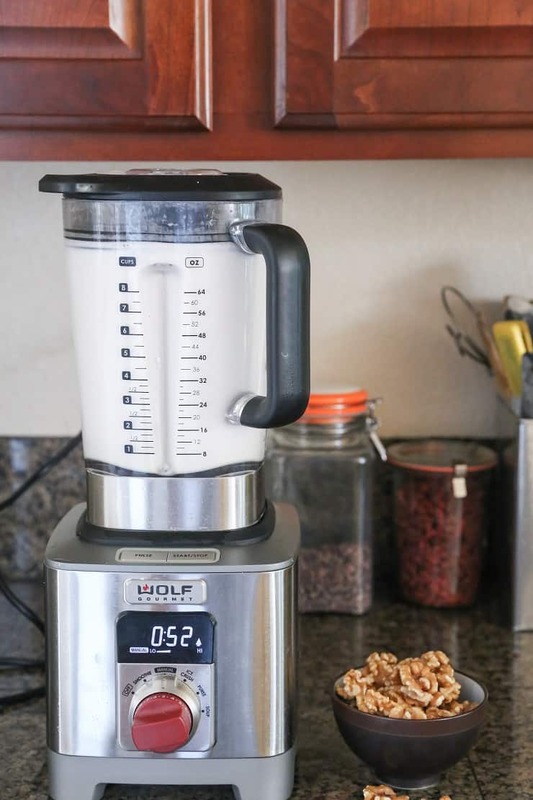 If you’re looking to make almond milk, cashew milk, or walnut milk, look no further! This easy tutorial on how to make nut milk will forever be your go-to and you’ll never want to go back to store-bought nut milk again! I realized how difficult it is to find store-bought nut milks without gums or emulsifiers (which can cause inflammation in folks with an autoimmune disease). Let’s talk gums for a second. Are they bad? Not necessarily. 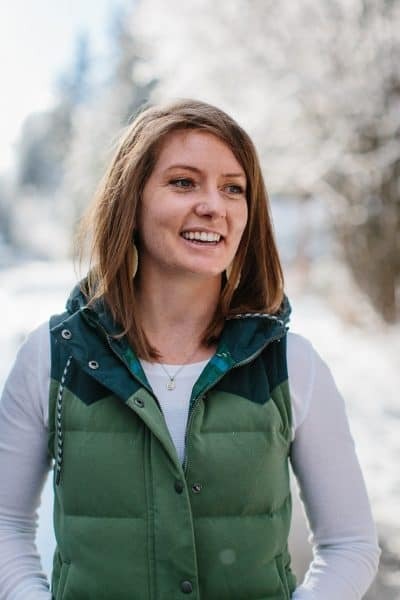 But if you have an autoimmune disease and follow AIP (the Autoimmune Protocol diet), you’ll want to steer clear of them until you’re certain your system isn’t reactive to them. While I don’t follow AIP, I do try to keep things are completely natural and free of additives as possible. In effort to do so, I figured I would finally make my own nut milks at home. I have to say, I think walnut milk is my favorite of all the milks. There’s just something about the flavor of walnuts that I find super appealing. Hint: If you don’t like the flavor of walnuts, you won’t like the flavor of walnut milk. 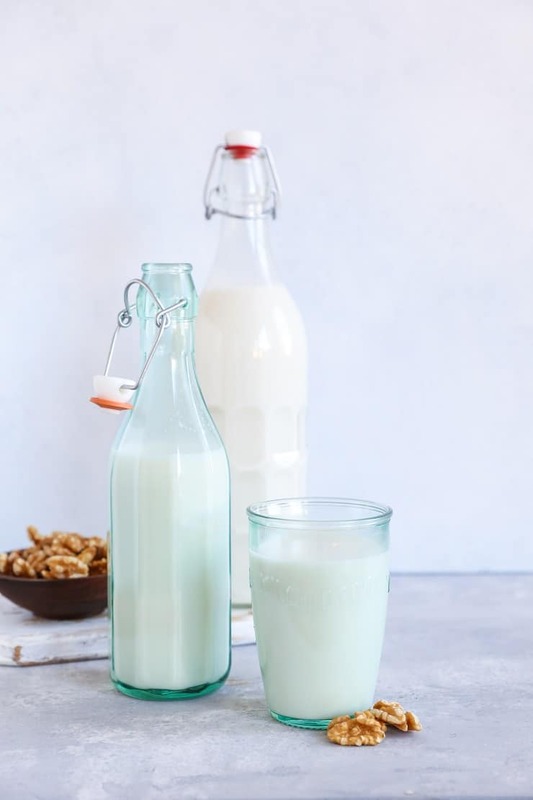 The basic premise behind making any nut milk is the same: You’re looking for a 1:2 ratio of nuts to water in essence: 1 cup of walnuts/almonds/cashews to 2 cups of water, or if you’re looking to double the batch: 2 cups of nuts to 4 cups of water). Note: You can play with the portion of water here if you’re looking for a thinner consistency. Drain and rinse them, then blend them for 2 minutes on high in a high-powered blender with water. After blending the nuts and water, you’ll have a nut milk. From here, you’ll want to strain the milk I use cheese cloth, but you can also use a nut milk bag . 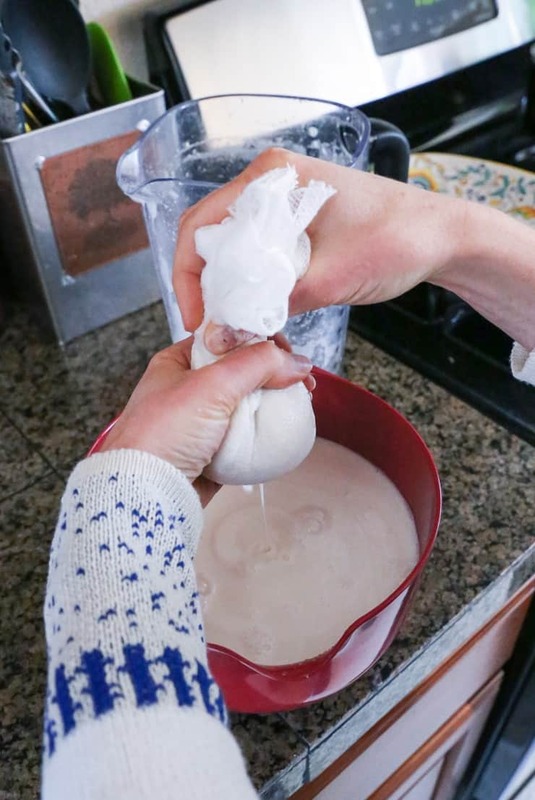 If you use cheese cloth, this is a 2-person operation (one person pours the milk over the cheesecloth while the other person holds it over a bowl. A rich, creamy beverage that you can use anywhere you would a regular milk. 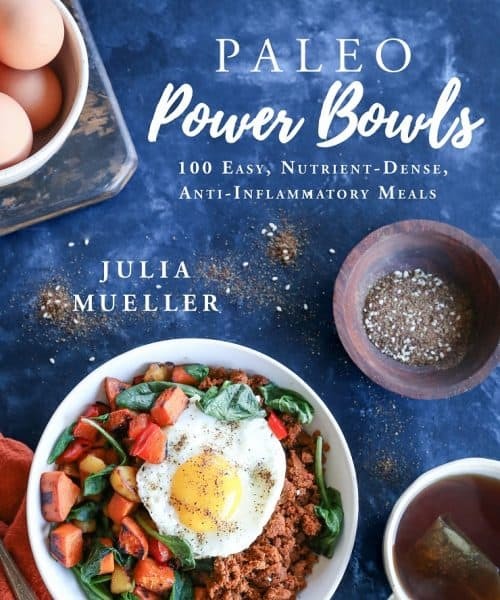 I love using it in turmeric or matcha lattes, and for snacking on my Cinnamon Raisin Paleo Granola. To sweeten or not to sweeten? I’ve always been on Team Unsweetened when it comes to my almond milk, cashew milk, or walnut milk; however, sweetening it opens up a whole new world into the realm of delicious beverages. You can use medjool dates (if using dates, you’ll want to blend them with the nut milk after it has been strained), pure maple syrup, or honey to sweeten the milk. Fan of vanilla? Add pure vanilla extract or the scrapings of 1 vanilla bean. Obsessed with chocolate milk? Add a few tablespoons of raw cacao powder (to taste) and blend like crazy! I typically make 4 cups of nut milk at a time, because I go through my non-dairy milk pretty quickly. There is one caveat to all this fun.. The thing about homemade almond milk (or cashew or walnut milk) is that it goes bad very quickly. We’re talking approximately 2-3 days. You turn your back, and BOOM, it’s no longer drinkable. For this reason, if you don’t go through nut milk fast enough, start with 1 cup of nuts and 2 cups of water. Be sure to store it in a sealed container in the refrigerator (I use a wide-mouth jar). It’s true what they say – homemade nut milk (or almond milk, etc) is a total game-changer. Is it more time-consuming than purchasing it from the store? Yes? But is the process fun and does it make you a badass? Yes. Is the end result better? Resounding yes!! I hope you enjoy your new nut milk making hobby! Let me know if you have any questions and always feel free to come back after you’ve tried it and let me know what you think! Place nuts in a bowl and cover with 1 to 2 inches of water. Soak overnight or up to 48 hours. 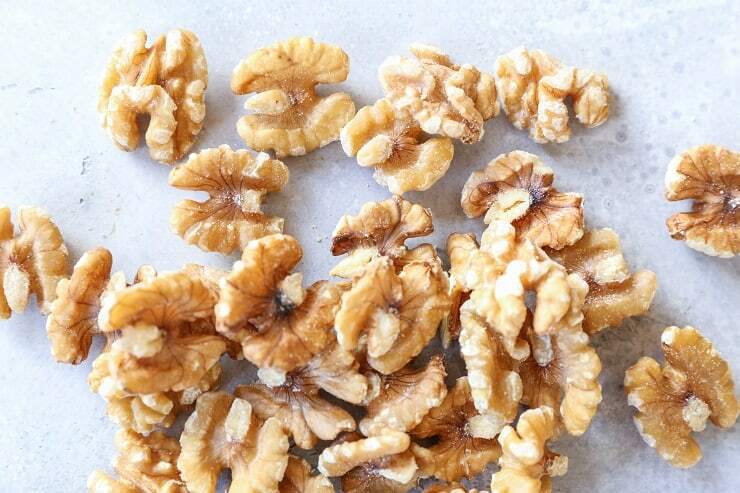 Drain and rinse the walnuts. 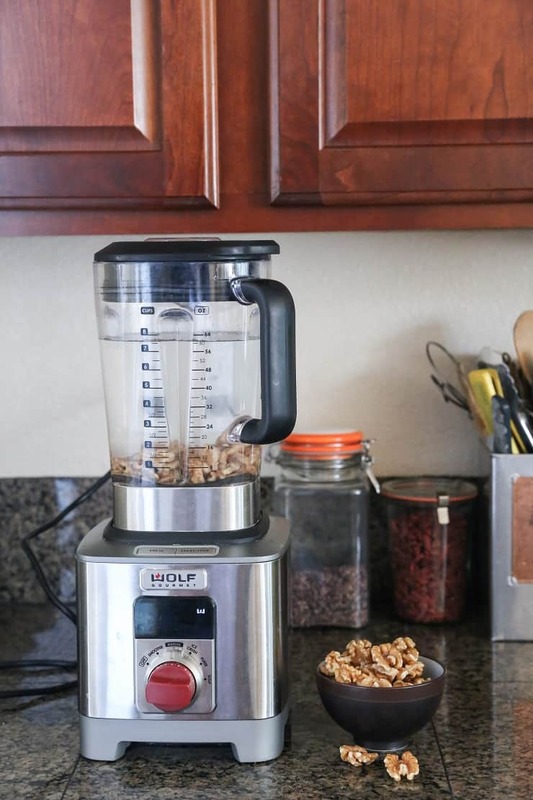 Transfer walnuts to a high-powered blender with 4 cups filtered water. Blend on high for 2 minutes. 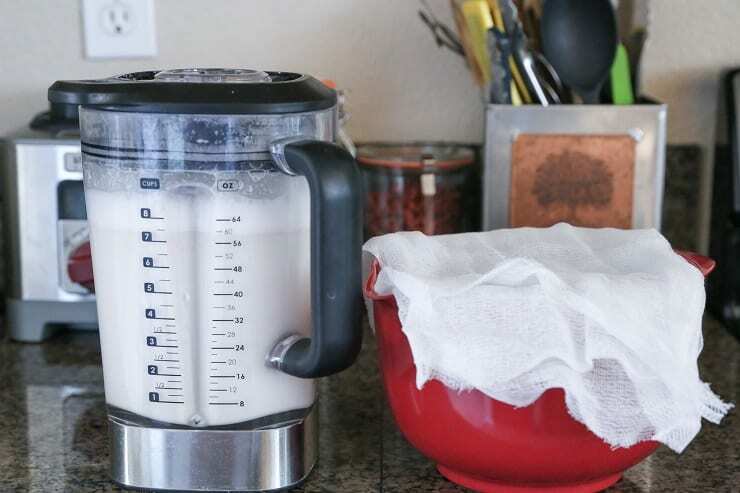 Use a cheese cloth or a nut milk bag to strain the milk. Squeeze the cheese cloth/nut milk bag to press all the milk out of the walnuts. 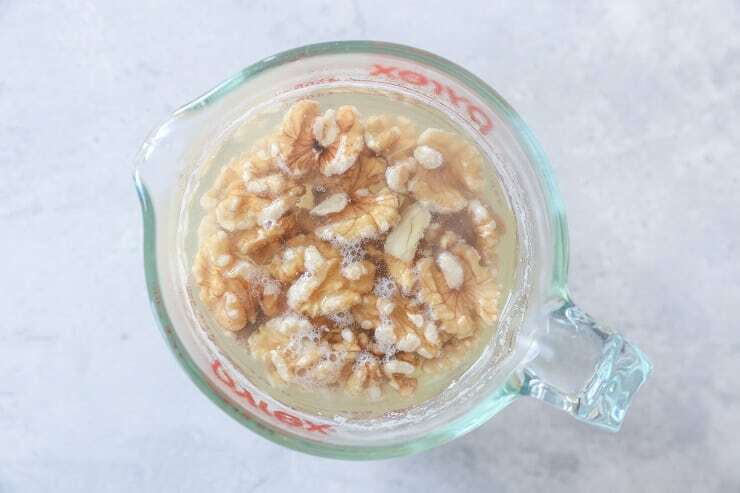 If desired, add vanilla extract, dates, pure maple syrup (or natural sweetener of choice), along with a dash of sea salt to sweeten the walnut milk. Transfer to an air-tight container and refrigerate. 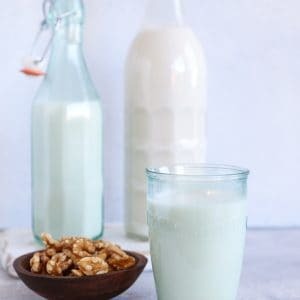 Use walnut milk within 3 days. 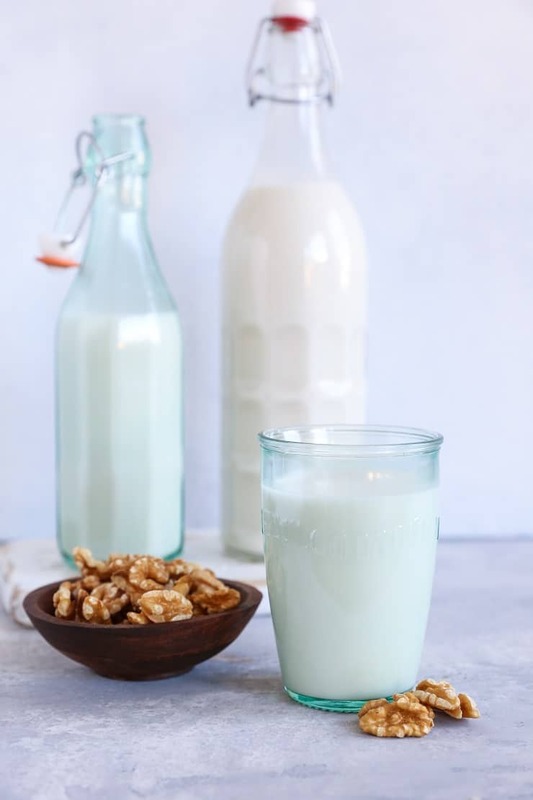 what can you use the solid leftover from the walnut milk for, it seems wasteful to throw it away? Hi Charles! You can bake it into cookies, cakes, or breads. I would try to dehydrate it first, or just be mindful that if you don’t dehydrate the pulp, you’ll need less liquid in whatever it is you’re making. With how popular milk alternatives are, this is great information. It’s always best to make your own and perfect to know how to do so. What happens if you don’t soak the walnuts. Why do you have to soak the nuts? This is easy and tastes great! I love that I’m not drinking preservatives and stabilizers. Thank you!